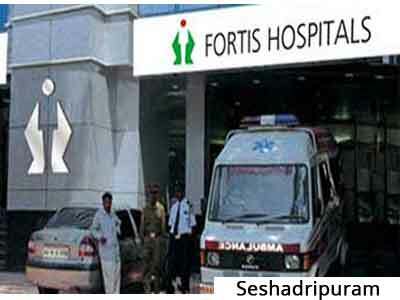 Bengaluru: Two surgeons and one anaesthetist of Fortis Hospital, Seshadripuram, have been directed by the Karnataka State Consumer Disputes Redressal Commission to pay a sum of Rs 23.54 lakh as compensation to the family a patient, who died on February 11, 2010, allegedly due to negligence of the doctors after a surgery at the hospital. The case is that of one K Vidya Prasad 45, a principal of Regency Public School, Vidyaranyapura who came to Fortis with complaints of lower back pain. After a relapse from a previous operation, she came under the care of Dr PK Raju at the hospital in 2010, who diagnosed her case as a ‘intra vertebral disc prolapse’, or ‘slip disc’ and advised surgery . She was operated for the same on February 11, 2010. While immediately post the surgery, her husband, HNM Prasad was informed that the surgery was successful, and the patient would be shifted to the ward, the patient soon began developing cardiac complications. Since there was no pace-maker facility at the hospital, her conditioned only worsened and she died before she could be shifted to another hospital. In 2011, the family of the patient lodged a complaint with the Consumer Forum, alleging medical negligence by the doctors who had operated on her. The commission came down strongly on the doctors for not taking due care and precautions in case of a cardiac patient. The commission held that despite “no cardiac care centre” present at the hospital, the doctors still ventured to conduct a surgery and “acted in haste in conducting surgery, that too when the opinion given with regard to the cardiac risk factor was involved in the case“. Her family have been awarded an amount of Rs 23.54 lakh as compensation, as calculated by the commission based on the method employed under the Motor Vehicles Act for accident cases. “On account of untimely death of the victim, the complainants being her husband and children are entitled to be compensated for the same though no amount of money can adequately compensate the loss of a person.” said the commission. Another doctor and a neurosurgeon who were consultants for the surgery were let off as they were not part of the decision-making process reports the Bangalore Mirror. thats really sad..if such wil be conditions for doctors in india,no doctor wud dare to take risk..I think we shud refer each n evry comorbid patient to tertiary centre.et patient n der relatives pay tripple the money for dis den..conditions r goin worse for docs in india..n govt. also wont considering us..
Can every district afford to have Highcourt or Supreme Court ? Most of the hospitals donot have cardiac care centres. But they have cardiac resuscitation facilities. This includes defribrillators. Temporary pace makers may also be available. If we insist that centres with cardiac vare centres should alone entertain surgeries may lead to a state where we ma not entertain surgeries. This patient being a known case of cardiac disease should have been referred to a higher centre with such facilities or the relatives should have taken her there. Hospital authorities should have informed them their limitations. The patients relatives should have sought the facilities available there. An informed consent should definitely have been taken. This should have their reluctance to take the patient elsewhere. Bangalore is a modern city with a lot of high tech hospitals. Let the patient and guardians take the decision , and we the surgeons be the treatment options providers . This will solve such judgements recurrences.